Something disturbing is happening off our Atlantic coast. Unprecedented numbers of great whales are washing up dead on our shores. Twenty-nine minke whales stranded between Maine and South Carolina from January 2017 to January 2018. Of those, 19 were already dead, but 10 were stranded alive. Stranding response teams made their best efforts, but only one whale survived. NOAA declares an Unusual Mortality Event, or UME, when a stranding is unexpected, involves a significant die-off of any marine mammal population, and demands an immediate response. In other words, an UME is an emergency. Alarmingly, this is the third emergency in the past year. On June 7, 2017, NOAA declared a UME for the critically endangered North Atlantic right whale. At least 17 whales were stranded in 2017, and another right whale – a juvenile female – was reported dead at sea off Virginia last month. The North Atlantic right whale has suffered serious losses since 2010. Scientists recently estimated that, at this rate of decline, they may become functionally extinct in less than twenty years (meaning there would be no individuals capable of reproducing left in the population). The loss of a young female therefore represents a particularly devastating blow. Elevated numbers of humpback whale have also been stranded along the Atlantic coast since January 2016. NOAA declared a UME on April 27, 2017. In a little over two years, 62 humpback whales deaths have been recorded (data through 01/30/2018), with strandings occurring in every state along the east coast. What is causing these deaths? NOAA is still examining many stranded individuals, but preliminary results show two main offenders: entanglement in fishing gear and blunt force trauma from collisions with vessels. Entanglement in fishing gear, and primarily in the thick ropes used by the offshore lobster fishery in the northeast US and Canada, is a primary driver of the North Atlantic right whale’s recent decline and other types of whale are also at serious risk. Collisions with ships and other at-sea vessels are another well-known cause of death. Being hit by a vessel of almost any length traveling at speeds of more than 10 knots can cause severe and often fatal injuries. But why is the rate of strandings increasing? The leading theory is climate change. It’s changing the distribution of animals the whales depend on for food – shifting them further north, and in some cases closer to the shore. Whales follow their prey into these new areas. They find themselves in shipping lanes or fishing areas, and at greater risk of collision and entanglement. What can be done to reduce these strandings? 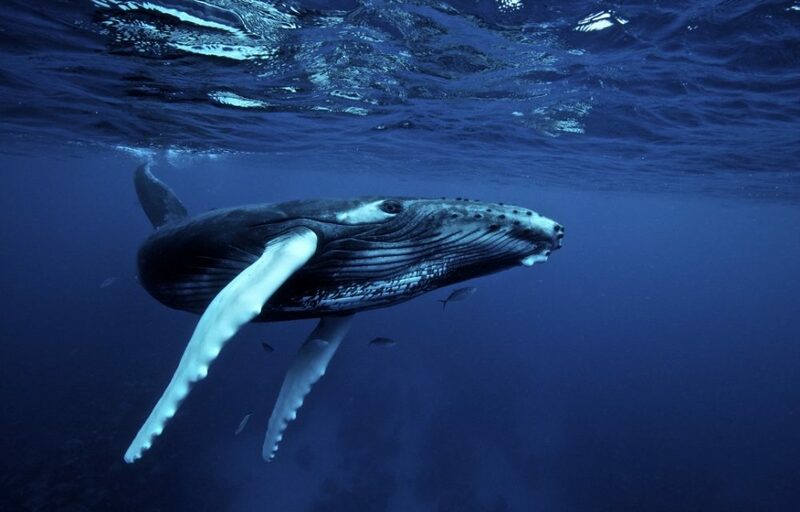 Whale habitat is shifting in a way that is heightening the conflict between these much-loved animals and the ways in which we use our ocean, possibly for the long-term. We therefore need lasting and timely protections from the stressors that are causing the most harm, such as more expansive regulations to reduce vessel speeds and a concerted effort to shift towards ‘ropeless’ fishing technology. NRDC is actively working with other environmental groups to advocate for these improved protections. It is also essential to minimize other stressors facing our great whales to give them the best possible chance of survival. To protect our whales, we must stop seismic. We must stop drilling. And we must protect the Marine Mammal Protection Act. As part of its atrocious giveaway to oil companies, the Trump administration has proposed permitting five large-scale seismic surveys that, if approved, would crisscross the mid-Atlantic and southeast coasts, blasting every 10-12 seconds for months at a time, with noise as intense as dynamite. Impacts to many types of marine life would be severe. For our Atlantic whales already struggling to survive, seismic blasting would drown out the sounds they rely on to survive over vast swaths of the ocean, making it impossible to communicate with one another, to find food, to detect predators. The stress of all that noise could also have long-lasting impacts on their health, making them less likely to be able to successfully rear young. The North Atlantic right whale, already teetering on brink of extinction, simply will not be able to withstand this assault. And of course, seismic testing is simply the first step down a path towards oil drilling off our coasts, placing marine life and our coastal communities at serious risk. It is also crucial for us to defend the Marine Mammal Protection Act (MMPA), the bipartisan bedrock legislation that has successfully protected our nations for over 45 years. The Act requires that industry act in a manner that minimizes harm to marine mammals. It will come as no surprise that special interests in Congress are actively lobbying to gut the Act. Go here to help save whales from seismic blasting in the Atlantic. Go here to help stop the Trump Administration’s offshore drilling assault. And go here to help defend the Marine Mammal Protection Act. And you can go here to contact your Congressional representative and make your voice heard.